Betsy and I are trying to get ahead on the packing/moving situation and one of the first things I tackled was a very large stack of cookbooks that I hadn’t looked at in over a year. For the poll last week, I had you guys pick a book from the stack and I said I would try out a recipe from that book. Well, it turns out that there was a reason why I hadn’t looked at these books in a very long time. For example, the winner of the poll was a book all about milkshakes. Sounds good right? Here’s the thing though… I expect there to be a recipe for ice cream, or many kinds of ice cream, in a book about milkshakes. It just makes sense to me. But this book doesn’t include a single ice cream recipe! I was put off, so I adapted what I thought was one of the better looking recipes in the book except I made my own Chocolate Pretzel Ice Cream. BOOYA. 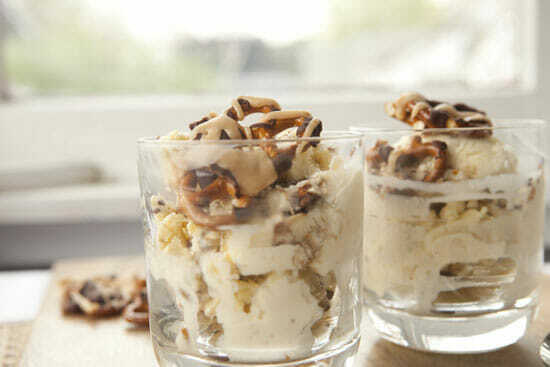 Homemade vanilla ice cream packed full of chocolate and caramel covered pretzels. Decadent and delicious! 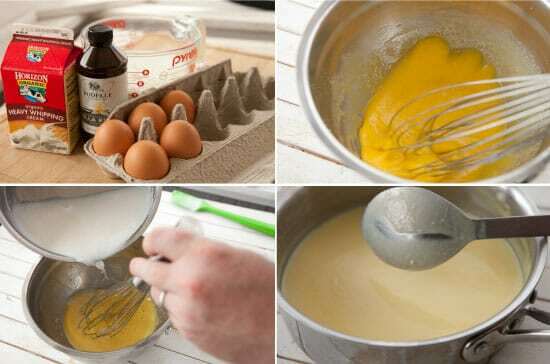 1) Whisk egg yolks with 1/4 cup of sugar until light and pale yellow. In a medium to large pot, add milk, 1/2 cup sugar, and 1 teaspoon of vanilla and heat over medium heat until steaming and sugar is dissolved. 2) Slowly whisk 1/2 of the hot milk mixture into the yolks, then whisk the hot yolks back into the hot milk, tempering the eggs. 3) Return the pot to low heat and heat, stirring constantly, until custard is thick enough to coat a spoon, about 5-6 minutes. 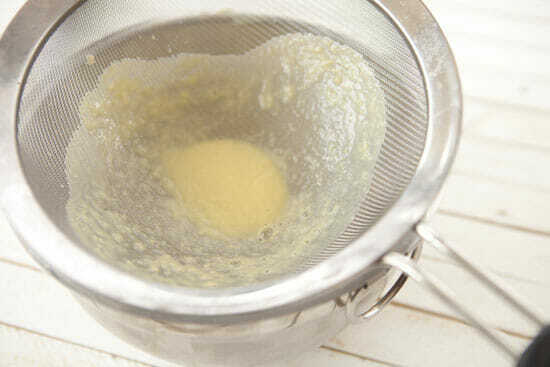 4) Strain custard with a mesh strainer and whisk in 2 more teaspoons good vanilla extract and cream. 5) Put mixture over an ice bath until chilled or chill in the fridge until very cold. 6) Add to ice cream maker and churn according to instructions. Melt ingredients over a double boil or a pan with some simmering water. Once ingredients are combined well and melted, drizzle over pretzels on a baking sheet lined with parchment paper. Add water, sugar, corn syrup, and a small pinch of salt to a small pan over medium heat. Stir until sugar is dissolved. When mixture starts to bubble, stop stirring although you can shake the pot occasionally. Cook until mixture is an amber brownish color which will probably take 4-5 minutes depending on your heat and pot. 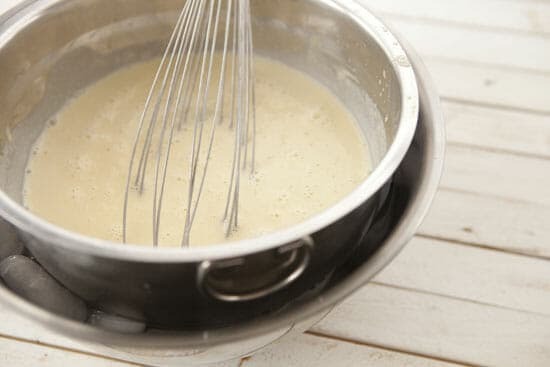 Remove sugar from stove and whisk in cream and vanilla. Be careful as it will bubble like crazy. Whisk until smooth. Drizzle caramel sauce over pretzels. Stir crunched pretzels into ice cream and freeze until solid. Serve with extra pretzels on top! The original recipe in this book is literally just: Buy ice cream. Stir in store-bought chocolate covered pretzels. Eat it. This recipe was in the “unconventional” recipes chapter. Like… really? Unconventional? 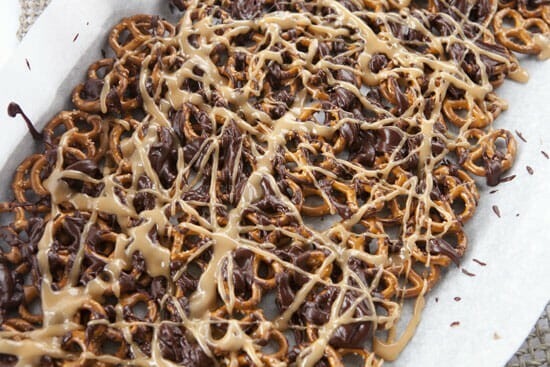 The recipe didn’t even tell you how to make chocolate covered pretzels, let alone chocolate caramel pretzels (better). But yes, I do think the ice cream is optional. 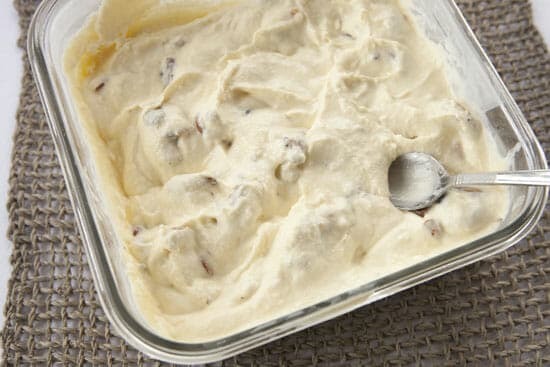 I personally like making ice cream at home because it limits my ice cream consumption, but you could skip this first part entirely and just buy some good quality ice cream. If you are making ice cream, the two pieces of equipment that I consider essential are an ice cream maker and a mesh strainer. The ice cream maker probably makes sense, but the mesh strainer might not make sense to you if you aren’t a regular ice cream maker. Basically though, you need to whisk egg yolks with some sugar and heat milk with sugar in a small pot. Then you whisk the hot milk slowly into the eggs with the goal of slowly raising the temperature of the eggs. It’s called tempering and while it generally works, you will probably get a few little bits of cooked egg in your final custard. The mesh strainer is important because before you churn your ice cream, you can strain out all those little bits. Not the best at making custard…. For full instructions on how to make the ice cream, check out the printed ice cream instructions. 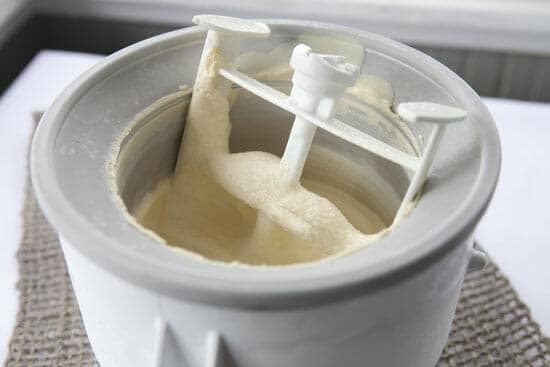 The only other trick to making good ice cream is to make sure that the custard is really cold before you add it to the ice cream maker. You can either stick it in the fridge for many hours or just stir it over an ice bath for a few minutes and it will chill down right quick. Then use your ice cream maker to churn it until it’s a soft-serve consistency. Stash this in the freezer while you finish the pretzel parts. 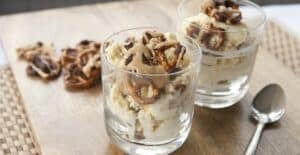 If you’re using store-bought ice cream (seriously not judging), the only trick is to take it out of the freezer and let it thaw a bit so you can easily stir in the pretzels, then you can re-freeze it. 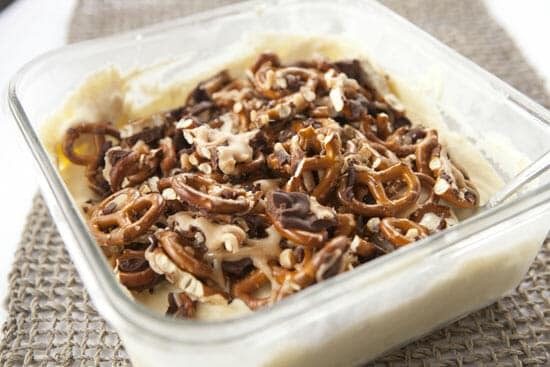 The things that you are mixing in are these freakin’ delicious chocolate caramel pretzels. The chocolate sauce is pretty straightforward. Just heat the ingredients over low heat (or over a double boiler) until they are just melted and combined and then drizzle them over a bunch of pretzels. I used about five cups of mini-hard pretzels. The caramel sauce is a bit trickier. Start by adding the sugar, water, salt, and corn syrup to a small pot and stir it over medium heat until it’s bubbling. Then don’t touch it and let it heat. You can shake the pan a bit just to move the sugar around, but don’t stir it. Just let it sit. After five minutes or so it will start to turn a light amber color and that’s when it’s done. Then whisk in your vanilla extract and cream. Be careful when you do this as it will hiss and complain at you. Then just whisk the sauce until it’s nice and smooth! Pour this over your pretzels and you’ll have some really good pretzels. I recommend stashing these in the fridge for 15-20 minutes so the caramel and chocolate solidify nicely. Try not to eat all of these. Okay… last step. While your ice cream is still slightly soft (or melt it a bit if you’re using store-bought), stir in many handfuls of the pretzels. You can really go crazy here. I had 1 quart of ice cream and I would guess I added 2-3 heaping cups of pretzels. I lightly broke them up but kept them somewhat whole. I’m not sure how many pretzels you should add. Stir these in and the freeze the ice cream until it’s nice and solid. I recommend serving this with extra pretzels on top because they are the best part. I like this as-is which ressembles the midwest iced treat called concrete which his basically very thick frozen custard with lots of mix-ins. Betsy preferred it as an actual milkshake though. I just blended a cup of the ice cream with 1/2 cup of milk and it was very excellent. In short, skip the book, maybe make the ice cream, definitely make the pretzels, enjoy. OMG! Seriously drooling over here!! I HAVE to make this up soon!! Yum this sounds/looks really good!! how does making your own ice cream curb your consumption? it encourages mine! For some reason homemade just fills me up more. Not sure if it’s because I know the work involved so I eat it slower or what but I definitely eat less of it if I make it. Kind of weird, I know. The downside is that you can make a mega-sized batch though! Might be the protein in the custard versus the crappy ice cream in the store full of pure sugar. I can destroy store-bought ice cream, but I find homemade custard harder to eat a lot of, too. I like going the 2-2-1 route for custard: Twice as much ounces of sugar and egg yolks as cream. So for 4 cups cream, I use 8 oz sugar and 8 egg yolks. Looks like you use closer to a 1.5-1.5-1 ratio. Interesting. I’ll give that ratio a try next time I make a batch. THanks for the tip! I love making ice cream!!! I totally agree… making ice cream is wayyy better then using store bought! Love the pretzel idea! Yum! Forget the ice cream – I’m just eating the pretzels! They look fantastic. A coworker of mine mentioned a long, but super easy alternate way of making caramel (in semi-large amounts). 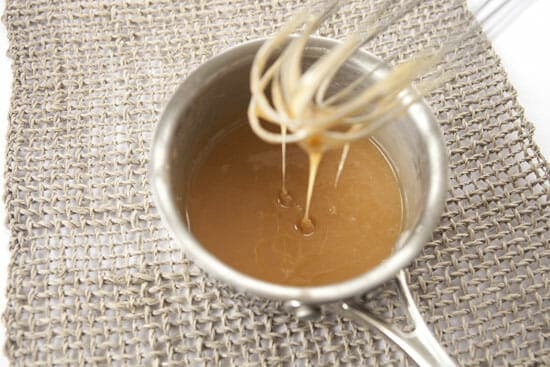 Simply boil a can of sweetened, condensed milk for roughly 3 hours – when you open the can, it will be all caramel inside. I thought this was an awesome thing for people like me who always burn the sugar!